I have just updated our website – let us know what you think of the new look. 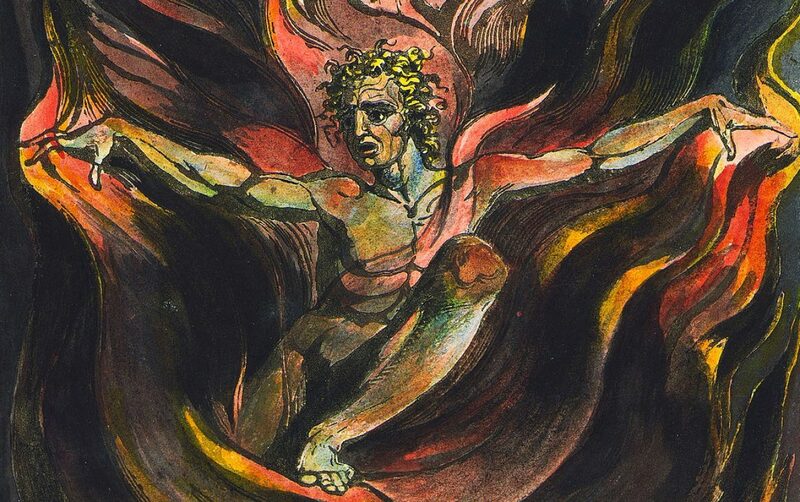 The featured image is now Blake’s engraving of Orc in the fires of energy, from his book America a Prophecy. His (Orc’s) fierce flames issued on all sides, Gathering strength in animating volumes, roaming abroad on all the winds, raging intense, reddening into resistless pillars of Fire rolling round and round, gathering Strength from the Earth’s consumed and heavens and all hidden abysses. Urizen resists with frozen storms and icy whirlwinds… Meanwhile the spirit of Imagination Los (aka Urthona) looks on horrified – sometimes taking one side sometimes the other. Orc cannot be denied, his energy must be faced and harnessed. Sadly recent events in the Middle East show us all too clearly what kind of destruction can be wreaked when this does not happen. Looks great: it is amazing how well Blake’s colours reproduce on-line! I’ve seen many of the originals and can say this is pretty faithful!